Fun, feisty and fired up, That Sugar Book is set to change the eating habits of a generation. When Australian actor and filmmaker Damon Gameau met a girl he was keen to impress he decided to get healthy by dramatically reducing his sugar intake. In no time he was slimmer, calmer, fitter and happier. He was also very curious: why did the elimination of sugar have such beneficial effects on his health and wellbeing? He decided to experiment and film the results. He would eat 40 teaspoons of sugar a day for 60 days. Crucially, he would only consume perceived 'healthy' foods like muesli bars, breakfast cereals, low-fat yoghurts, juices and smoothies. Released in conjunction with That Sugar Film, the book contains all the information from the film plus the wonderful bits they were forced to leave out. 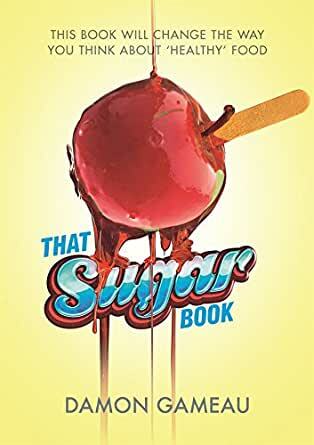 Fans of Sarah Wilson and David Gillespie will love That Sugar Book. BASED ON THE DOCUMENTARY, THAT SUGAR FILM, THIS IS AN EXPLOSIVE EXPOSÉ OF THE DANGERS OF SUGAR. Having watched the film I wanted to review the details again - it's really well written, easy to read and includes lots of recipes to start you off. I wanted to join the quitting sugar movement.and this book told me all I neede to know, gave encouragement and motivation. A wonderful book! It is a good book by content, but the ebook is difficult to use because it is not in the usual format. You can't increase font size or anything like that. The print is very small and looks basically like a photocopy of the paper back. Not recommended as an ebook. 5.0 out of 5 starsEnjoy! Great read. I now have to watch the film! No problems with reading it on my phone & tablet. Great book! Provides the theory to help you understand what you need to in order to succeed. Great easy to follow recipes. I lost 6kg in the first week! Really interesting book and some great recipes. I like the way that he also gives an option for slowly reducing the sugar instead of going cold turkey too. A very good read, and for sure fascinating! Really detailed and in depth. Can definitely say I will also be quitting sugar thank you.